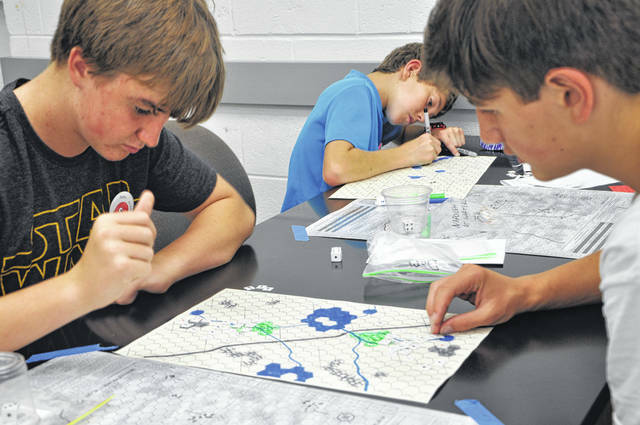 Colby Graham, an eighth-grader, creates his own battlefield to play during the Intro to Classical Wargaming course Friday. Graham said what he enjoyed about the course was that some battles could be based in history, but once you learned the rules, you could create whatever kind of battle you wanted. Last week, local students put themselves in the shoes of Napoleon Bonapart and British and Prussian forces during the Ohio Wesleyan/Junior League of Columbus Summer Camp’s Intro to Classical Wargaming course. This week will conclude the three-week program where OWU hosts students of various grade levels for a week’s worth of activities and courses. In the Intro to Classical Wargaming course, students engaged in numerous battles after learning the basic rules of “Napoleon at Waterloo” — a classic board game. In the game, players pick a side in the Battle of Waterloo and are given control of pieces with various strengths and movement ranges, and pitted against each other. Combat is resolved with a combination of statistics and dice. Instructor Matt Myers, a math teacher at Olentangy Liberty High School, said the course has been popular for years, and he took over instructing the course after the previous instructor retired. Myers said the games get competitive and give the students a little historical perspective. Myers said after teaching the rules and playing the game several times at the start of the week, students were given their own hex grids and pieces, and allowed to design their own battlefields and armies. He added students got a chance to be creative or create a game based around something they are already familiar with, like Star Wars. “One student was even looking up a real battle from history,” Myers said. Alex Zeyen, an incoming freshman in the course, said it was “like a board game but way more strategic,” and his favorite part was making his own battleground. Intro to Classical Wargaming was just one of dozens of courses offered at OWjL, according to Myers. “It’s a great program,” he said. “It offers a variety of experiences to students. They enjoy the freedom of choice in the classes they take. OWjL continues this week with students in sixth and seventh grades.